If you use a furnace as the main heat source for your home, you know how important it is to keep it in excellent condition at all times. Any problems with your furnace can mean that your home is not able to provide you and your family with the comfort you rely on, and during the winter months, furnace problems can be a health and safety concern. At Ball Heating & Air Conditioning, we know how important your furnace is to your Wichita home, and how important your heating is you and your family, so we're always ready to provide you with the highest quality furnace repairs possible. Our professional heating contractors have extensive experience and training working with all types and brands of furnaces, so we're able to quickly and accurately diagnose and solve any problems that you encounter. We'll work quickly to get your furnace back into great condition so that your home can be warm and comfortable, but we'll never let speed take the place of quality workmanship. Any time you need repairs for a furnace, you can always depend on our professionals for reliable work. If your pilot light frequently goes out, your furnace may only be able to produce heat intermittently. It may also not be able to produce heat at all. We can find the source of this problem and fix it promptly and professionally. If your filters are cleaned or changed on a regular basis, your Wichita home's energy efficiency will significantly decline. This increases your heating costs and makes it more difficult for your furnace to heat your home. Essentially, you'll be paying more money for less heat. Whether air flow problems stem from belts, bearings, or fan motors, they'll often result in your furnace overheating, or in poor heating control. When your thermostat doesn't function properly, you'll have difficulty controlling the temperature of your home. You may end up without any heat at all. We can repair or replace your thermostat to give you peak control and maximum efficiency. Regular maintenance for your furnace is the best way to save money on repairs and replacements of your furnace. Regular tune-ups and prompt repairs will help you keep your Wichita home's furnace in the best condition possible year-round. 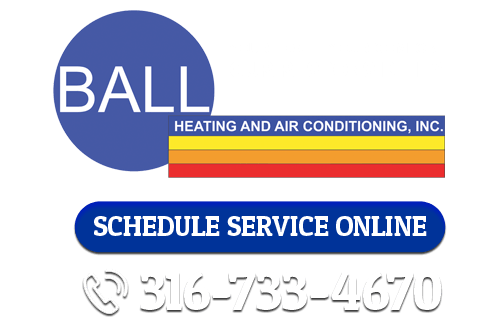 If you're looking for furnace repairs in Wichita, call Ball Heating & Air Conditioning at 316-733-4670, or fill out our online request form.